Our First Pop-up Was A Success! Pop- up by definition: Denoting a store or other business that opens quickly in a temporary location and is intended to operate for only a short period of time. On Friday we packed the car with everything needed to cook for the owner of Silgrey Resort We planned on making lunch for Mike using the fruits of his garden. He was very generous with his produce earlier in the week when we had just met him. 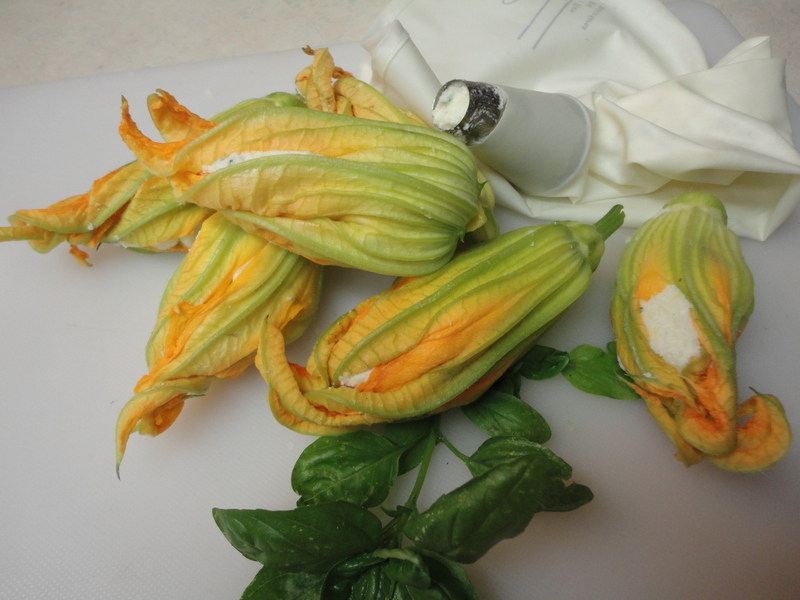 We wanted to show our appreciation for the beautiful Zucchini Flowers he gave us by cooking for him. 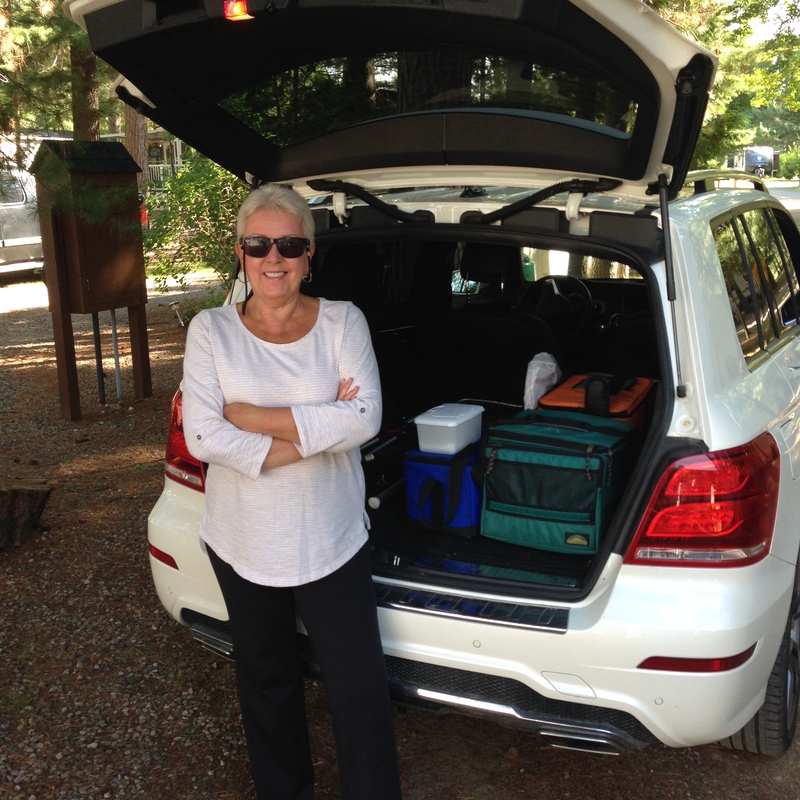 We arrived at the resort about 11:30 with everything necessary to Pop-up. 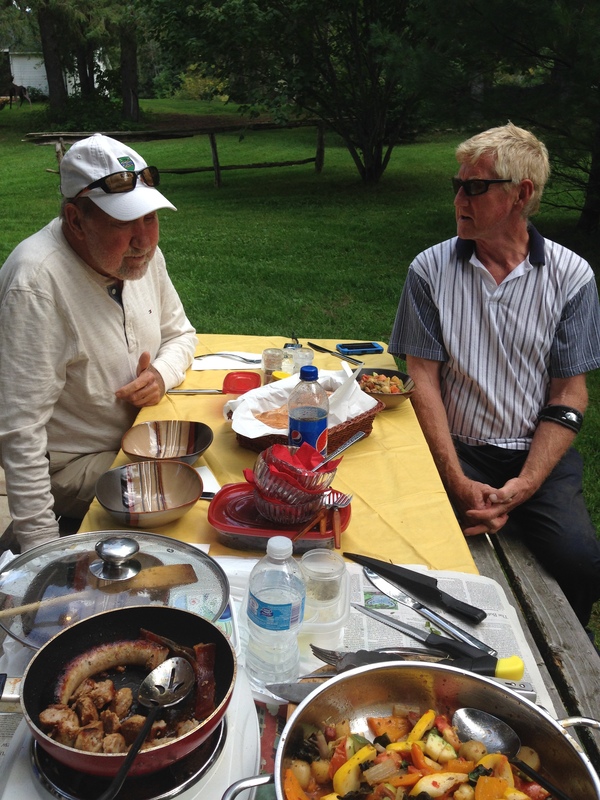 Harry and I got started by cooking a wonderful farmer’s sausage to accompany the Summer Ratatouille. You’ll remember we made it last week for the first time after our visit to the local farmer’s market. Next the chopping of the veggies began. Its Harry’s specialty. 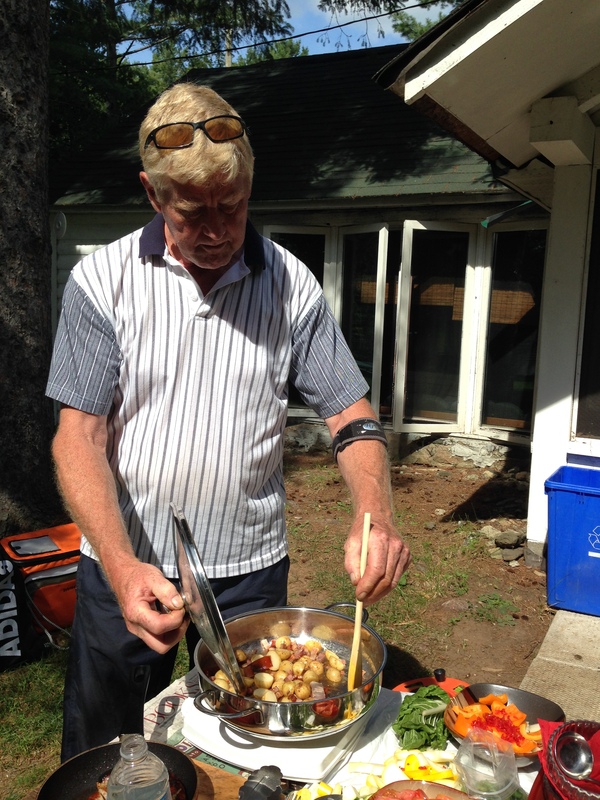 Nobody preps food like Harry! I like to do a lot of the actual cooking but his skilled prep makes the whole thing come together so professionally. Even Mike lent a hand with the stirring. He told us he had been so inspired by our walk through the garden earlier in the week that he had harvested and prepared one of his own spaghetti squash for dinner the night before. Lets not mention here that he and his wife ate like a family of 4 because it was so delicious! Its just between us Mike. Within no time our lunch came together. Today we had the most varied Summer Ratatouille yet. 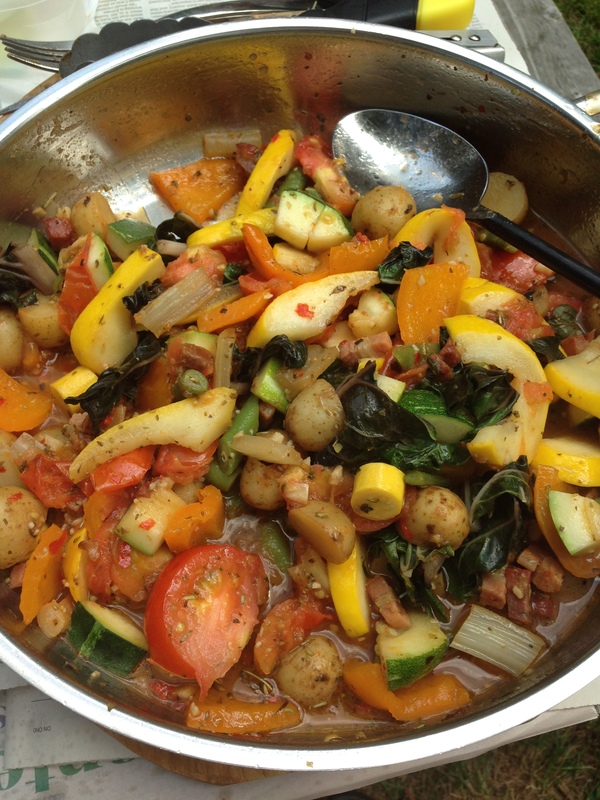 Mike’s garden provided us with Tomatoes, Globe Squash, Swiss Chard (stems and leaves), Green Beans and we supplemented that with Sweet Peppers, Pearl Potatoes, Patty Pan Squash, a Hot Red Chili and Double Smoked Bacon. What doesn’t benefit from the addition of Bacon? Well, it looks like we’ve come to the point in the festivities where we get to indulge, taste, eat, savor and delight in the spontaneous cooking experience of the pop-up! 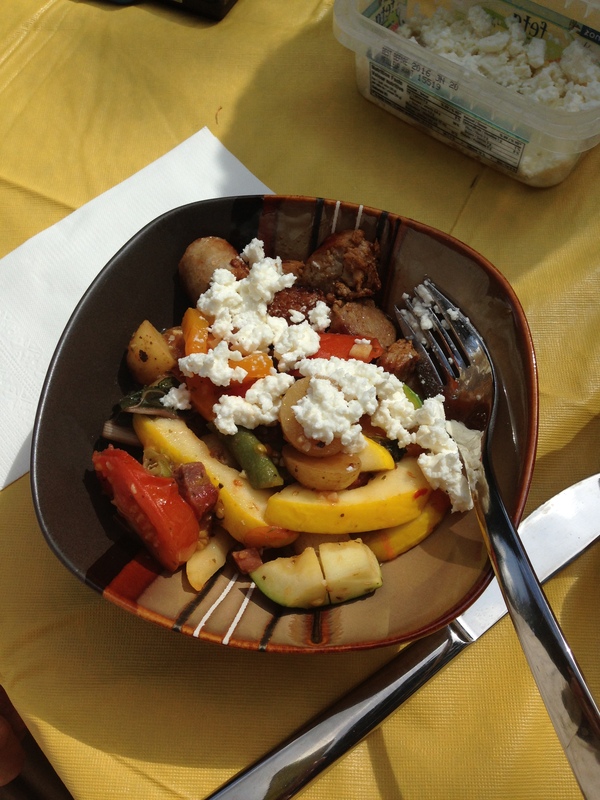 We wish you could be here to try this wholesome lunch made mainly of right-from-the-garden vegetables with a bit of quality Farmer Sausage and topped with fresh Feta. To make this a meat free dish don’t use bacon and do not add a side of sausage. This dish has great flavor as a vegetarian meal! 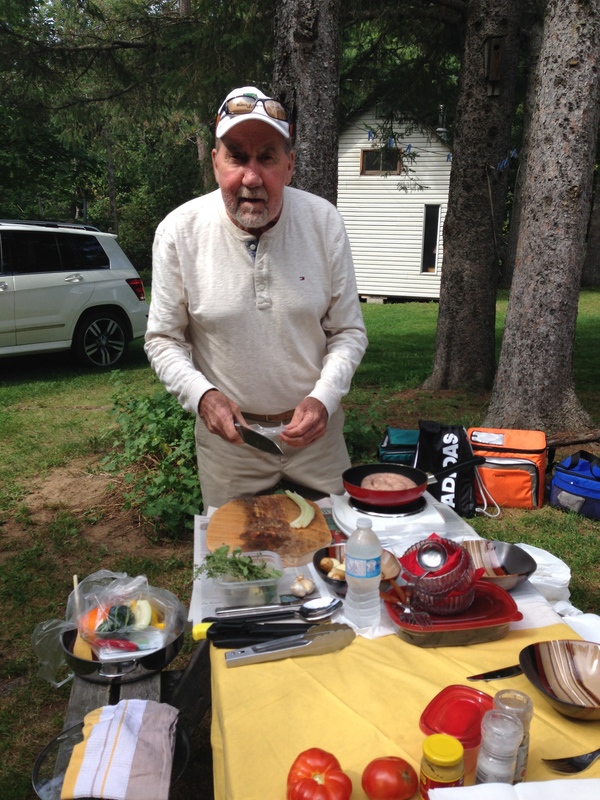 A great big thanks to Mike of Silgrey Resort for providing such an amazing setting for our very first pop-up! Lets do this again real soon! We concluded the meal with a dessert of Muffin Guts, but you’ll have to wait to find out what that is in a few days. We can’t give it all away right now. Just so you know, Mike loved it! So don’t be scared when you see us post it.